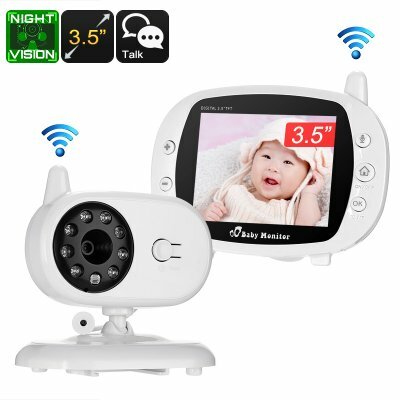 Successfully Added Wireless Baby Monitor - 3.5 Inch Display, Temperature Monitoring, Two-Way Audio, 3M Night Vision, IR Cut, 2.4GHz, Play Songs to your Shopping Cart. Never lose your beloved baby out of sight with this wireless baby monitor. Thanks to its 2.4GHz wireless connection, this IP camera is extremely easy to install and use. Coming with a 3.5-Inch monitor, this nanny cam constantly provides you with clear images of your sleeping child. By supporting a wireless range of 300 meters, it functions properly in virtually any size of house. You will be able to use your display with up to four cameras at the same time. Therefore, this wireless camera could either be used as a nanny cam but alternatively also as an indoor IP camera to keep track of what’s happening in the other rooms or at the entrance to your property. This wireless baby monitor features a CMOS sensor that provides you with clear visuals at any time of the day. Thanks to its 8 IR LEDs and IR cut, it even allows you to see what’s happening in your child’s bedroom after dark. With 3-meter night vision support, you will be treated to clear images even in the darkest of rooms. Your camera furthermore features a 70-degree viewing angle. Therefore you’ll be able to see what’s happening in the entire room without experiencing any blind spots. The baby monitor and wireless camera support two-way audio communications. This means that you’ll always be aware of when your child wakes up or simply can’t fall asleep. It furthermore lets you talk to your baby without needing to physically have to be present in their room. Additionally, your nanny cam is capable of playing songs that will stimulate the sleep of your baby. With a temperature sensor in place, you can be guaranteed that your child never will get too hot or cold. From now on, you will always be able to keep an eye of your child and make sure that he is resting safe and sound while you’re enjoying your time downstairs. This nanny cam comes with a 12 months warranty, brought to you by the leader in electronic devices as well as wholesale electronic gadgets..